During the ten years we have been publishing Woodcarving Illustrated, it has become very clear that the growth of woodcarving relies heavily on the strength of the community of carvers. And so this year we want to recognize two individuals who have invested their energies to inspire, teach, encourage, and popularize woodcarving—often at the expense of their own carving time. 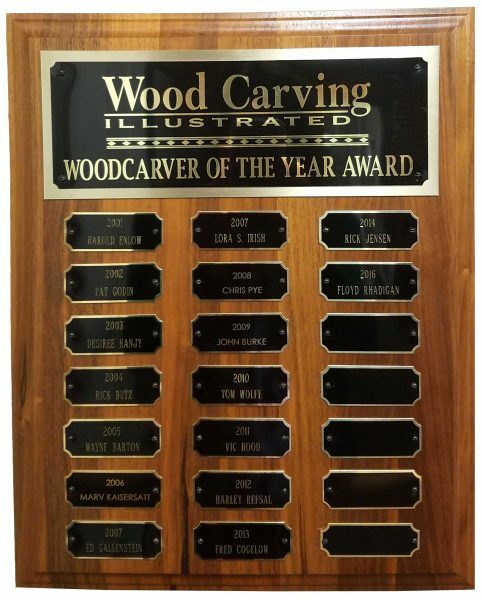 We’re pleased to present this year’s award to Ed Gallenstein, President of the National Wood Carvers Association and longtime editor of Chip Chats magazine, and Lora S. Irish, noted author/designer and founder of Classic Carving Patterns (www.carvingpatterns.com). No one has devoted more of their time and efforts to supporting the carving community than Ed Gallenstein—a legendary force and dynamic personality. Working with limited resources and almost single-handedly, Ed built the National Wood Carvers Association from 500 members to a peak of more than 50,000. Another avid promoter of the art of woodcarving and selfless supporter of the carving community is Lora S. Irish. Through her carving tutorials and detailed patterns, she has inspired countless carvers to pursue their passion for carving wood. What makes these two honorees special is the way both embraced the latest methods of spreading the word about carving and became pioneers in their chosen mediums. 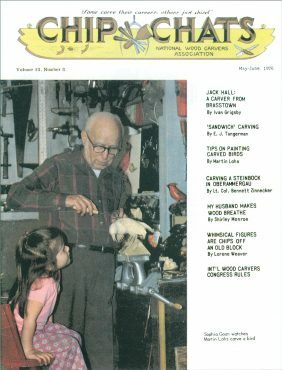 Ed was instrumental in growing the National Wood Carvers Association to an entire postwar generation. Ed, through the NWCA, provided an organization to unite carvers and an outlet to showcase their talents and connect them as a single group when no other entity of its kind existed. Lora provides expert guidance and a wealth of resources for today’s technologically-savvy generation, utilizing the Internet as a tool to introduce carving to an entirely different community. A quick comparison with other hobby organizations illustrates the incredible legacy of Ed Gallenstein. The largest national association of woodturners has a membership of 13,000 and a multi-person staff. A national association of scroll saw artists has 1,000 members. In fact, we know of no woodworking association of any size, general woodworkers included, that even approaches the membership size of the NWCA. Ed’s national organization has spawned the creation of almost 400 local carving clubs who look to the NWCA for help in promoting membership, increasing show attendance, and networking in general. Ed Gallenstein, an avid woodcarver since 1935, first heard about the National Wood Carvers Association in 1962. 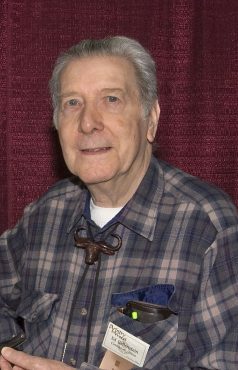 The organization’s dedication to the interests of amateur and professional carvers and whittlers is very dear to Ed’s heart, and he was honored to be elected president of the NWCA in 1971. Even before assuming the important role of president, Ed contributed to the carving community through his involvement in the organization’s publication, Chip Chats. The publication began in 1953 when founding member of the NWCA, Stephen LePage, distributed a three-page bulletin to the organization’s 19 members. The founders of the NWCA were not professionals or even particularly skilled carvers; they were just hobbyists who wanted to converse with others with similar interests. Ed carries on that tradition today with a 132-page publication distributed to more than 30,000 members of the NWCA. 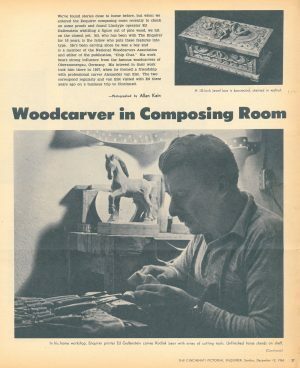 Ed’s first brush with fame was an article published in The Enquirer in Cincinnati, Ohio, featuring his carving talents. John Giglio, a professionally-trained Italian carver, saw the article and contacted Ed. The two carvers became friends, and Ed wrote and submitted an article about Giglio to then editor of Chip Chats, Leo Sawyer. Leo was so impressed with the article, that he asked Ed to join the staff of Chip Chats. At that time, NWCA membership was growing rapidly, and the number of pages in the newsletter were expanding as well. As Leo prepared for retirement, he began transitioning responsibilities for the publication to Ed. 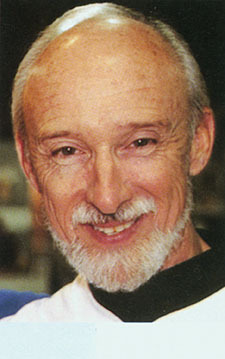 Under Ed’s tutelage, the publication evolved from a mimeographed, bulletin-type newsletter to a “real magazine.” In the early 70s the magazine was printed and folded by a commercial printer, then the signatures went to Ed’s house where his wife and four children pitched in to collate, staple, trim, and pack the magazines. Chip Chats remained headquartered in the Gallenstein home for 23 years until they first rented office space in 1988. As president, Ed worked to establish an NWCA-sponsored scholarship at the Miami University of Oxford, Ohio, to benefit a Department of Art student interested in sculpture/woodcarving. Ed worked tirelessly to collect the names of individual woodcarving clubs in the country and to make that information available to the general public. Individual carvers could then locate and connect with each other in a social setting. In 1976 Ed introduced a coming events calendar to Chip Chats. Carvers could now find out when and where events were happening in their area, and who to contact for more information. This monumental task was the first of its kind and connected carvers in a way that was not previously possible. At 84 years old, Ed is still committed to building the carving community, although the magazine keeps him too busy to carve. Ed was the first recipient of the Dayton, Ohio, Carving Guild’s Ron Ryan award. The award is presented to one person in the carving world who demonstrates the ideals of selfless giving, expressing goodwill, and exerting the extra effort needed to promote these qualities in one’s own community, and throughout the woodcarving world in general. Ed Galenstein died April 7th, 2015. 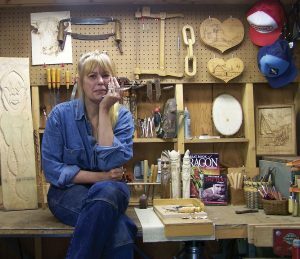 Lora Irish operates one of the most-visited woodcarving web sites. Classic Carving Patterns (www.carvingpatterns.com) was one of the first of its kind and has been extremely influential in bringing carving into the digital age and introducing woodcarving to a new generation. Lora has always had a deep appreciation for the arts. Her mother is an oil painter who operated a ceramic and crafts studio for 20 years. Lora learned many of the skills she uses today for pattern making and drawing from her mother. Her father restored antique guns, which often entailed carving gun stocks. Lora fondly recalls watching him carve as a child, and in fact, learned the art of woodcarving at her father’s bedside. When her father became terminally ill, Lora and her husband Mike would visit often to offer her mother support. “I would sit with Dad, and he taught me how to carve.” Lora said. “He couldn’t hold the tools anymore, so he used me and my hands to do the work. He told me where he wanted his next cut. When I wasn’t carving, I was drawing. We drew the designs he wanted to carve.” The day her father died, her mother presented Lora with her father’s carving kit—passing a love of carving wood from one generation to the next. Those sketches done at her father’s bedside eventually became her first published book. 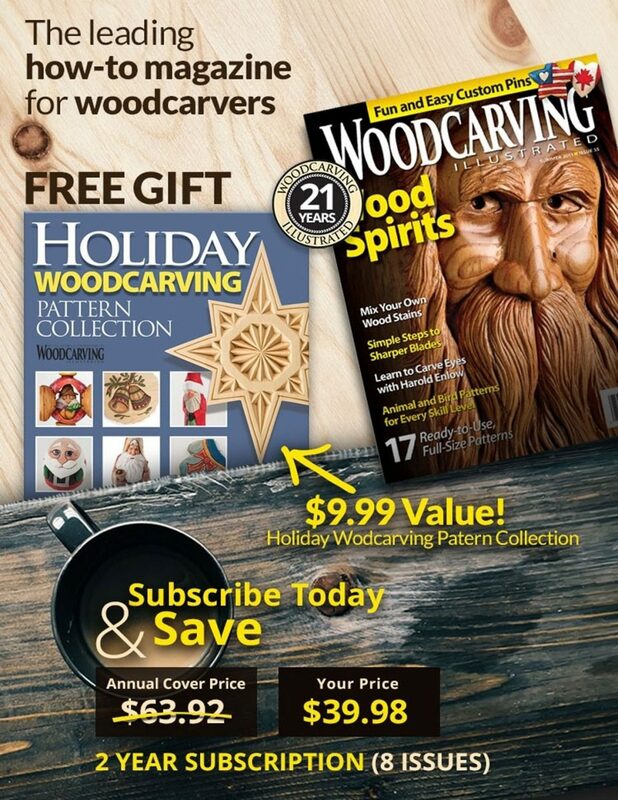 Husband Mike is a cabinetmaker and Fine Woodworking magazine subscriber. At his urging, she bundled up her patterns and shipped them off to Taunton Press, Fine Woodworking’s parent company. Classic Carving Patterns came out later that year. Mike launched the couple’s first website in 1996. The site cost $35 a month to operate, and featured 12 fine art dog prints created by Lora. “I thought we were ruined,” Lora said. “I couldn’t imagine who would want to buy my dog art.” Lora received her first order within a week of the site going live. In 1999, Lora submitted Landscapes in Relief to Fox Chapel Publishing. The book marked the beginning of a continuing series of titles published with Fox Chapel, all of them top-sellers. In addition to her skills in pattern drafting, Lora discovered early on that she really enjoys teaching. 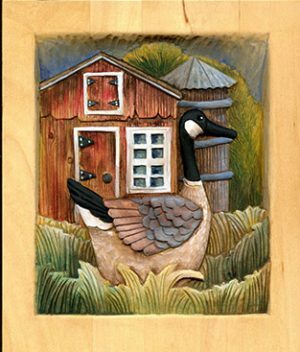 The step-by-step tutorials offered in her books help carvers reach new levels with their own art, but she was looking for a deeper level of connection. That desire to connect with her students was the basis for her website. 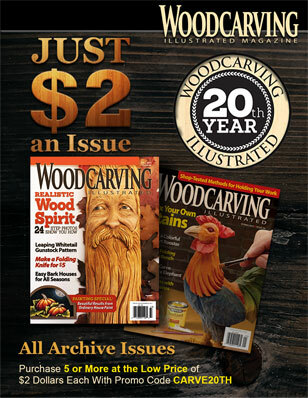 One of the top-rated woodcarving websites on the Internet, it features well over 1,500 patterns and designs for carvers. The impressive pattern collection is just the beginning of what Lora offers visitors. The site also includes projects and tutorials, as well as tips and techniques covering everything from transferring patterns to applying a finish to your carving. Probably one of the most valuable things Lora offers is her own personal e-mail address. Lora takes great pains to respond to inquiries and offers coaching and encouragement to aspiring carvers. One-on-one digital communication and feedback from an accomplished carver is the next best thing to having one at your side. For artists who are unable to receive mentoring from a carving club due to their geographic location, Lora provides support via the computer. Her web site is an invaluable resource for carvers working on a late night project who need a few tips to help them over a rough spot. Lora said there are three main things that influenced woodcarving as we see it today. The first was E.J. Tangerman’s books, which brought carving into the home. The second was the way that Ed Gallenstein connected small groups of carvers so they could share their accomplishments. “Everything stops in the studio when Chip Chats arrives,” Lora said. “The computer goes off, the phone goes off the hook. Mike and I go out on the porch and we go through it page by page. It’s an absolute joy.” The third major influencing factor is the Internet. The interaction that the Internet fosters between the author and the carver, no matter what their physical distance, would be difficult to achieve any other way. Visit Lora S. Irish’s websites HERE and HERE. CLICK HERE to purchase books by Lora S. Irish.